Marked cards shoes scanner are the based on new strategy and work with the perspective tables. 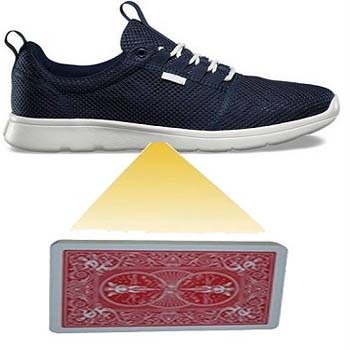 , marked cards shoes camera device are look like normal sport shoes but can see all the cards placed on the table through Shoes Camera Poker Marked Cards Scanner. Function: When play every card game, user will know the all about the number of cards using cheating cards shoes camera device. First of all user need to mount our special camera underneath and turn on the button by which camera can scan all the cards and display the result on the other display device.